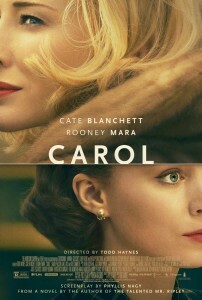 December 10, 2015 — This year’s San Francisco Track and Field Club Movie and Social night concludes with a partnership with The Weinstein Company for a special preview screening at AMC Van Ness for the highly anticipated mid century drama, CAROL. Adapted from American author Patricia Highsmith’s (The Talented Mr Ripley) novel “The Price of Salt,” CAROL follows two women from very different backgrounds who find themselves in an unexpected love affair in 1950s New York. Therese Belivet (Rooney Mara) is a clerk working in the toy department of a Manhattan department store. Her eyes comes to life when she meets Carol (Cate Blanchett), an alluring woman whose beauty and elegance arouse the curiosity of Therese. As the spark between the two women becomes a flame that gives them hope of finding that true love, Carol’s steps are checked by her unforgiving husband who threatens to keep their daughter away from her should she go ahead with the divorce. This love that was unspoken of in the fifties, illustrates the pain and the seemingly impossible circumstance that gays and lesbians have to surmount in a pre-Stonewall era. Rob Maier loves the story telling device of showing the same scene at the toy department twice hence providing “a different perspective, figuratively and visually” for the audience on each occasion that the scene plays out, highlights how one seemingly simple event can have a life-changing impact in our lives. CAROL opens in San Francisco December 11, 2015.